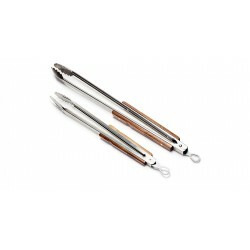 Petromax BBQ Grill and Coal Tongs are available in 2 sizes. Perfect for dutch oven cooking, with an easy way to manage your food and coals on the grill. Made from stainless steel, these will last you as long as the Petromax products that you use them with. The Petromax ZA BBQ Grill and Coal Tongs are made from stainless steel with a wooden handle.